"I wanted to thank you for great service, product, and of course the good deal you gave is! You were not kidding when you said our water would taste and feel like spring water. Even the color has changed from a dingy grey to crystal clear. Another big change was my families health, with less colds and even allergies. I could go on and on with the benefits such as clean clothes, using less soap, even healthier plants, but you already know these things. I'll just close with letting you know that this was the best decision ever. Please feel free to have anyone, who needs a recommendation from an owner to give us a call. We will gladly tell all what a great system this is!!" ~ Steve & Laura, San Diego, CA. "The Filtercon system has been a pure joy. It is so convenient it is to be able to drink clean water from any faucet. I also love the feel of the water when I take a shower. My hair and my skin feel so smooth and clean you really can’t believe it until you have one. We used to have a water softener that used salt. When you took a shower it felt really slippery like you couldn’t get the soap off, ever! Now, with my new system I get a real thick lather no matter what soap I’m using and I rinse off clean immediately. The best part however, is that there is no maintenance. He used to have to lug home heavy bags of salt and fool around with the water softener. Not anymore! We are thinking of moving and if we do we are taking it with us." 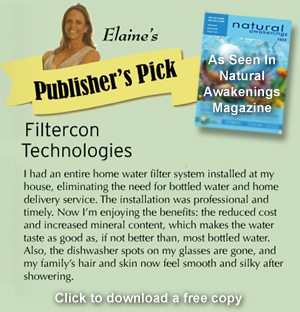 "We have had the Filtercon system for over four years and would not live without one. We are very health conscience and know that minerals should be in the water and are essential for good health. Minerals are also what give water good taste. With our Filtercon System we are get rid of the chlorine taste and smell from our water, and in its place is delicious water with all the healthful minerals. The really unique thing about the system is, is that even though the minerals stay in the water we never get any of those heavy hard water spots we used to get. We put up with hard water for so long because we didn’t believe in putting salt into our water. That’s why when we learned about the Filtercon Whole House System that doesn’t use salt, or remove the good minerals; we knew it was for us. This Filtercon System has not only been good for our health but is also 100 percent environmentally friendly. Thank you Filtercon for meeting our needs. We highly recommend you!" ~ Marschke Family, Denver, CO.